Dueling Pianos: Celebrating Independence, July 4th and live music all July! Premier Piano Shows Orlando features Amy and Randy’s Dueling Pianos!! by Premier Piano Shows Dueling Pianos. 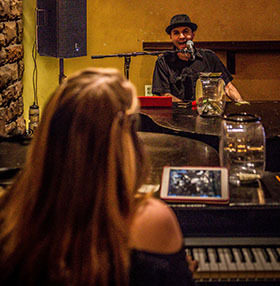 Dueling Pianos is a concept that started in high tourist areas like New Orleans, Orlando, and Las Vegas. The concept has branched out to be one of the most fun, interactive musical experiences in the country. In Central Florida, Premier Piano Shows provides the leading dueling piano entertainer teams. We bring audiences a great time at Orlando corporate events, weddings, and restaurants/bars. 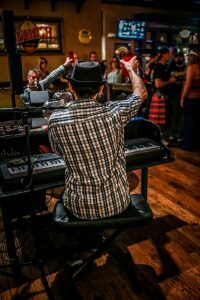 The Premier Piano Shows Dueling Piano brand is proud to have the talent and flexibility to adapt to all sorts of event scenarios, from family-friendly fundraisers to adult comedy nightclub shows. Amy and Randy Keith, married musical couple that calls Orlando home, brings a unique dynamic to the concept. We also occasionally feature other musical instruments, including but not limited to: flute, violin, harmonica, tambourine, manual beatbox, kazoo and air guitar. We love coming into a restaurant or corporate event in which the two pianos are littered with song requests before we even start the show. People who have had the dueling piano experience know that they need to come with cash and song ideas to request, in order to have a bit of “control” of the show. We love to “be fair” and give priority to generous requests, yet we will never flat out refuse requests like you may have seen in past dueling piano shows. Our 2-3 hour shows are a musical experience that ebbs and flows — sometimes there is dancing, and sometimes a lot of birthday or anniversary celebrations. Other times, people are just singing along and drinking while occasionally carrying on their conversations, just as told in Billy Joel’s epic true story, “Piano Man.” Our focus is always on adapting the content and variety of the show to our crowds — from the latest Justin Bieber hit for the millennials, to B-side Beatles tunes for baby boomers, we love playing them all. Many of our restaurant shows feature another member of our team, Jason James. Similar in vocal range and repertoire to the veteran dueler Randy Keith, the two together pull out some serious white boy rap, hence the name “Two White Crew” (or is it “too” white?). They’re not afraid to pull out some Taylor Swift or Miley Cyrus too. Randy has other dueling piano partners team up as well, keeping the variety of comedy and repertoire at each show fresh and spontaneous. Come experience a dueling piano show in Central Florida with the best, the Premier Piano Shows Dueling Pianos… Along with booking various corporate events, fundraisers, retirement communities, and weddings in Orlando and Tampa, we provide dueling piano entertainment at half a dozen restaurants in Orange and Brevard counties. Happy 4th and all of July!